Why the difference? The answer is a complicated mix of personal preference, diplomatic protocol and religious dictates. 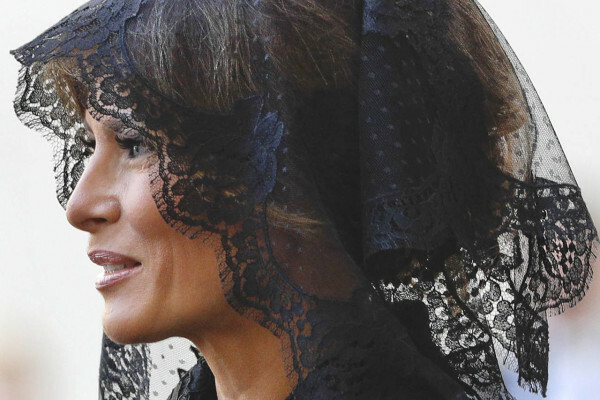 Stephanie Grisham, a spokeswoman for the first lady, said Mrs. Trump’s decision to wear a black lace veil known as a mantilla followed Vatican protocol that women who have an audience with the pope must wear long sleeves, formal black clothing and a veil to cover their head. In Saudi Arabia, however, the government did not request that Mrs. Trump wear a head covering known as a hijab, or a headscarf, Grisham said. The Vatican’s rules of attire are not strictly enforced. Many women, including high-ranking dignitaries, have visited the pontiff with their heads uncovered, including German Chancellor Angela Merkel in 2015 and Aung San Suu Kyi, Myanmar’s top civilian leader, this month. Many women wear veils out of respect. Mrs. Trump is Catholic, which likely made accompanying President Donald Trump for a meeting with the leader of the world’s more than 1 billion Roman Catholics all the more meaningful to her. When a Vatican official handed her a rosary, the first lady immediately gave it to the pope to bless. She spent time in front of a statue of the Madonna at the Vatican’s children’s hospital and laid flowers at its feet. She also prayed in the hospital chapel. Every woman in the U.S. delegation wore a veil, including Ivanka Trump, the president’s daughter who converted to Judaism before marriage. In Saudi Arabia, the first lady dressed conservatively for her arrival Saturday in the capital of Riyadh. She wore a long-sleeved, high-necked, black pantsuit that mimicked the loose, black robes, or abayas, that Saudi women and female residents wear. Her attire during the two-day visit hewed to the protocol for high-level female visitors: modest dress, longer sleeves, higher necklines, pants and long dresses.